It has been established, that given our story and how quickly things progressed for Mr. Narwhal and I in the beginning, we knew pretty early on that this was the real deal. I mean, the morning after our first kiss he sent me the following image and I just about died. I had known for awhile that I wasn't a diamond girl. Influenced by movies like Blood Diamond, and a generally clutzy girl, I didn't feel comfortable with a large investment on my finger, the sentimental value was already enough of a pressure for me. I just knew I wanted something different. Early on in our relationship, I had been doing some Google/Etsy searching for twig bands. I remembered seeing one years earlier that was the most amazing and unique ring I had ever seen. I was on a search to find something similar and that's when I stumbled upon this ring. It was perfect and beautiful and oh-em-gee amazing. I had to have a ring just like it. That's also when I discovered that this ring was not only the most perfectly perfect twig band, but also a moissanite. A moissan-what? That's when I started reading. 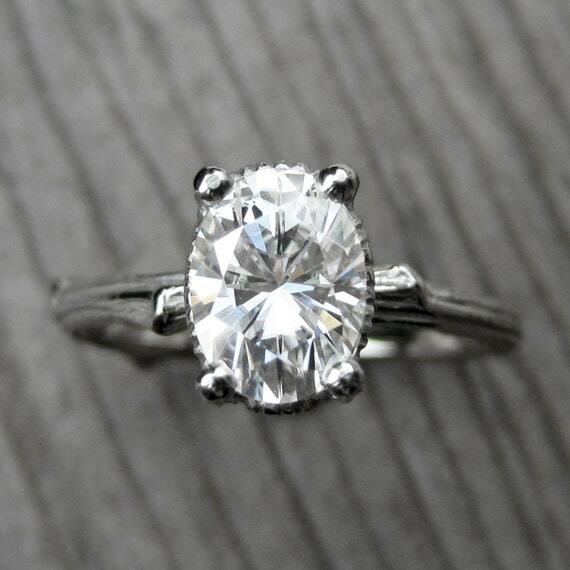 The romantic in me thinks of moissanite as having an origin from a shooting star. The practical side of me loves the price. The ethical side of me loves the lab creation. It is the epitome of what I wanted in a stone. Not long after I discovered the Kristin Coffin ring, I messaged Mr. Narwhal and let him know that I didn't want a diamond ring when the time came. He was pretty happy about this, and as the conversation progressed I told him about moissanite and left it at that. In the next day or so, I received this beauty via text message. We all had a good laugh. We carried on in life and progressed in our relationship, not discussing rings again for many months. In August 2013, Mr. Narwhal asked me what I wanted my ring to look like. I was able to share my dream twig ring and he really loved it. Now, ordering a ring off Etsy is so far from his style, so I went to a local jeweller to get a quote on what a moissanite twig ring would cost him. I passed on the information and never brought it up ever again. Little did I know I would end up waiting another year until I got to see my beautiful ring, but let me tell you all, it was worth the wait. When Mr. Narwhal opened up that little box I was in love! Aside from the beauty of my ring, one of my favourite parts about it is the amount of work Mr. Narwhal put into designing it. He was slightly disappointed by the service when he later went into the jeweller I originally went to, so he went about finding someone else. He ended up getting a girl from Muskoka in school to become a jeweller to make the ring. 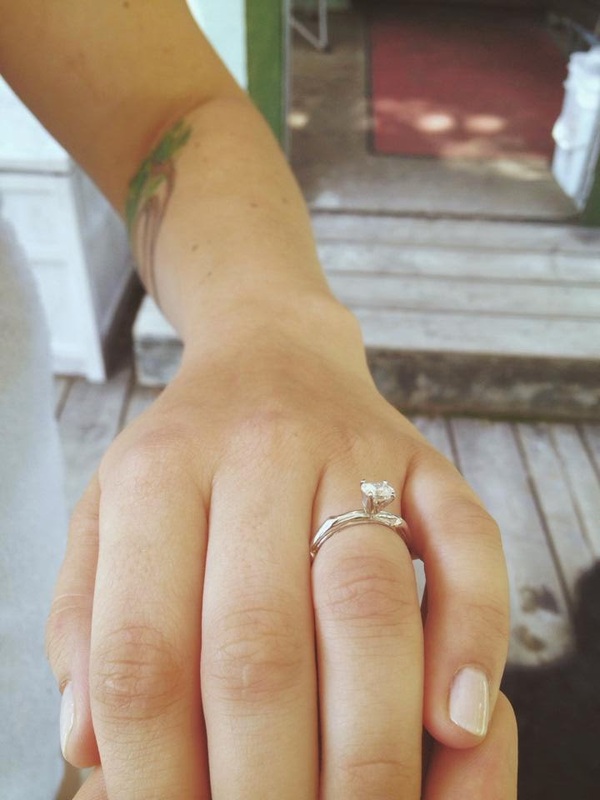 She is the younger sister of friends of ours and I am so grateful he chose to give her the opportunity to make my ring. I am also a huge fan of him asking for the oval stone to be sideways. We'll work with her in the future on designing my custom wedding band as well. The whole process and end result was more than I could have ever dreamed of. The boy did good. Did you play a role in picking out your engagement ring? What a lovely story, I truly enjoyed reading about it! I've had issues with jewelry before in the past and have always taken my items to a jewelry expert who was able to help out. This might be an option that you might consider in the future if this ever happens again to you. It's nice knowing that professionals are at the ready.